This blogspot will be a source of information particularly to members and our Friends of Lions regarding services, activities, meetings and fellowships. Your views, opinions and contributions regarding Lions services or otherwise would be appreciated. 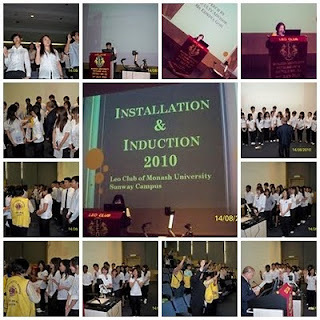 14 August 2010 saw the Induction of new members by R7C IPP Nelson Wong and Installation of the 2010/2011 Board of Directors by President Lynda Yeng of Leo Monash University Malaysia at Sunway Campus. Witnessing this auspicious occasion were Z17C Chan Kee Oi, District Trainer Shirley Koh, Faculty Leo Advisor Edwina Goh, Leo Advisor Irene Hoi, Alternate Leo Advisor Jamie Chen and ex-Leo Advisor Dr Karen Lee. 1. All members shall abide by the Lions Constitution and the By-Laws made hereunder. 2. 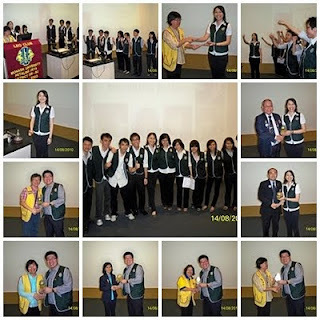 The registered address of the Lions Club of Petaling Jaya Mutiara shall be at No. 17 Jalan 2/28, 46000 Petaling Jaya. 3. The Club’s correspondence address for the fiscal year shall be that of the Presiding President or such other address as advised by the Presiding President. 4. Authority is given to any two out of the three persons mentioned below to operate the Club’s current account and/or fixed deposit held at Malayan Banking Berhad, Damansara Utama Branch, Petaling Jaya under the name of Kelab Lions Petaling Jaya Mutiara. President, Secretary & Treasurer. 5. Meetings shall commence at 7.30 pm and be completed by 9.30 pm on the same day. Business Meetings shall be held on the 1st and 3rd Friday each month at Sri Melaka, 1st Floor, Amcorp Mall, Petaling Jaya. Board Meetings will coincide with the 2nd Business Meeting of each month. Members shall send their apologies for non-attendance or being late via President or Membership chairman. 6. A member’s Annual subscription in the Club shall be a non-refundable of RM300.00 to be paid half yearly in June and December of the fiscal year. Affiliate Member shall pay one lump sum of RM380.00 per year. Life Member shall pay one lump sum of RM150 per year. 8. The dress code for attending club meetings shall be club vest. Slippers, jeans and collarless t-shirts are NOT allowed at any time. For projects, club t-shirt must be worn. Any change in the dress code shall be made at the discretion of the President with consultation with the Organising Chairman who will give notice to members prior to project/activities. All dinner functions shall be dark pants, red shirt with dark color coat and name tag. 9. A prospective member may be invited to become a member after attending three  meetings or projects / activities or a combination of both upon consideration and recommendation of the Membership Chairman to the Board of Directors. As for Transfer member, written recommendation is required from previous Club. He/she shall pay all membership dues before officially being inducted into the Club. 11. Club voting delegate(s) at the International, OSEAL and District Conventions shall be nominated by the Board of Directors and endorsed by the members. 12. The tail twisting fine shall be twenty  sen per fine. The amount of tail twisting fines at special functions shall be determined by the Tail Twister and the Board of Directors with a maximum of RM2.00 only per fine. 13. The President shall be allowed to pledge / donate a sum not exceeding RM200.00 per cause on behalf of the Club without the approval / consent of the Board of Directors for emergency cases and the President shall exercise their discretion judiciously. Donations or pledges exceeding RM200.00 shall be sanctioned by the majority of the Board of Directors. 14. The Club shall grant not more than RM200.00 cash or kind to Club’s Youth Exchangee Hosting Family. Subject to availability, the Club shall give two badges each to the youth exchangees. The Club shall grant not more than RM100.00 in cash or kind to the outgoing youth exchangees sponsored Leo Club Member or member’s children. Subject to availability, the Club shall give three badges each to outgoing youth exchangees. 15. The Club shall allocate to the Outgoing President not more than RM300.00 to purchase Yearly Awards for Club Members and not more than RM200.00 to purchase Yearly Awards for LEO Club upon recommendation by Leo Advisor and consultation with the Faculty Leo Advisor. 16. At the discretion of the Board of Directors, the Club shall allocate not more than RM100.00 to purchase Outgoing President Customary Award. 17. The Club shall allocate not more than RM150.00 each for purchasing presents, wreaths or flowers on the occasion of any members or members' spouses delivering new born and/or deaths of immediate family members of members and such other cases deemed appropriate by the President. 18. Subject to the availability of the Club's convention fund, the Club will sponsor cost of one (1) registration fee for International Convention, OSEAL Forum & Multiple District Convention. Such sum is to be shared equally among the participating members should there be more than one. For every 1-3 delegates the Club shall sponsor 1 registration fee and every 4-6 delegates the Club shall sponsor 2 registration fee. Only registered members and those who have attended the full program of the Convention shall be entitled to claim. Club to subsidize RM100 for members attending School for BOD and Key Officers and Club shall pay the rate whichever is lower. However, if costs exceed RM100.00, the expense shall be shared by those attending. 19. Subject to availability of funds, members may find it necessary to specially assign funds raised from “Special Projects” to the Convention Fund/Administration Fund. As such, the final amount of sponsorship to attend any Lions Convention or Forum shall be determined by the Board of Directors, thereafter, for presentation to and approval of club members at any business meeting. 20. Sponsorship for Leo Club Monash University Malaysia. 20.1 The Club will sponsor one registration fee for Leo(s) attending the Leo Forum. Should there be more than one participant; said sponsorship shall be equally shared among the participating members. 20.2 The Club will sponsor RM100.00 to the Leo Club for organising their Anniversary. 20.3 The Club will sponsor RM100.00 to the Leo Club or RM10.00 per Leo whichever is the lower for attending Sponsoring Club Anniversary and Installation. 20.4 The Club will sponsor one registration fee to be equally shared by Leo/Lion Advisor attending Leo Forum. 20.5 The Club will sponsor RM100 for their Initiation/Induction/Installation Ceremony. 21. Members may vie for the Melvin Jones Fellow and District Fellow with the consent of the Board of Directors and the recipient chosen by a majority and voted by club members. 22. DG-Elect may appoint member(s) as Cabinet Officer for his/her ensuing fiscal term. Said Appointed Member(s) who wish to accept the appointment, should get majority consent of the Board of Directors before accepting portfolio. of the Board of Directors.